The Hafele SensioPod 822.82.330 is a pop up power box designed to be elegantly hidden in your counter or table surface, the top is made out of black blastic with silver pull handle. When you need to charge your devices, simply pull up the handle on the top and you can plug into your choice of 3 power outlets with fuse protection or 2 USB charging ports. What is unique about the SensioPod is that it can go in any table surface including wet areas such as kitchen countertops, there is a rubber gasket that prevents liquids from entering the unit. In its closed position the unit is IP54 splash proof rated but needs to be plugged into a GFI outlet with it's single 8' power cord. There is a small lid in the top that when opened allows cables to be plugged in with the lid closed. 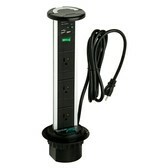 The SensioPod is ideal for kitchens, restaurants, dorm rooms, airports, or any table surface that needs charging. 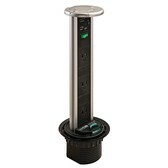 Please be aware: The space needed below the surface is 14.5", the outlets are not tamper resistant. The Hafele SensioPod 822.82.930 is IP54 rated which means when it is closed is splash rated. The entire unit is ETL listed for the USA and c-ETL listed for Canada. To install simply cut a hole 3 5/8" round, drop it in and secure with the included locking collar to the underside of your counter, installation instructions are included. Space needed below surface: 14 1/2"